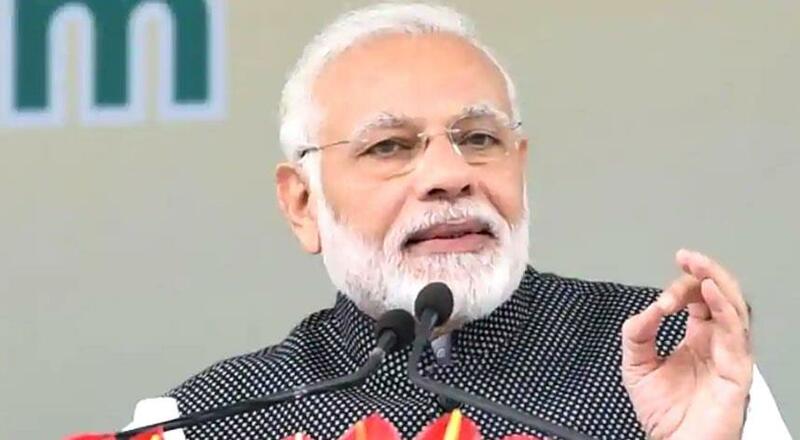 Tiruppur, Feb 10: Prime Minister Narendra Modi on Sunday inaugurated a slew of projects, including the passenger services on the last stretch of the underground Chennai Metro stretch between AG-DMS and Washermenpet, marking the completion of the Phase-1 of the project. Tiruppur where he also laid the foundation stone for the Rs 2,467 crore modernisation of Chennai International Airport Phase-II and for new Integrated Terminal Building of Tiruchirapalli International airport to be constructed at a cost of Rs 951.28 crore. K Palaniswami, Deputy Chief Minister O Panneerselvam and Union Ministers. Mr Modi also inaugurated the ESI Hosptial with 100-bedded facility at Tiruppur and ESI Medical College and Hospital with 470-bed facility at KK Nagar in Chennai. Later, the Prime Minister addressed an election meeting, the second after the one on January 27 at Madurai, where he kicked off the BJP's campaign for the ensuing Lok Sabha Poll. The Chennai Metro Rail Limited (CMRL) officials completed the trial run 0of empty trains after Commissioner of Metro Railway Safety (CMRS)–Bengaluru circle K A Manoharan, had on January 19, undertook safety inspection of the final line of CMRL Phase-I project connecting AG-DMS and Washermanpet stations. Central, High Court, Mannadi and Washermenpet. After the two-day safety inspection, trial runs on the track commenced and it was inaugurated today for passenger services.